As many of you already know, on July 14, Winnipeg’s beloved band The Weakerthans called it quits. Now in all honesty, they haven’t released anything in a long time and haven’t toured for a while, but I am sure there were many fans out there like me hoping for another album. Especially after the treat that was John K. Samson‘s solo album, Provincial. But enough about the sadness, The Weakerthans did that enough for all of us. They showed us all that sappy is punk even without power chords and they did so masterfully thanks to Samson’s amazing lyrics. I honestly hadn’t thought of this show for a long time, but as soon as I read the news of their breakup I had a flashback. Let’s go back together to that fateful night at Babylon in November 2001. 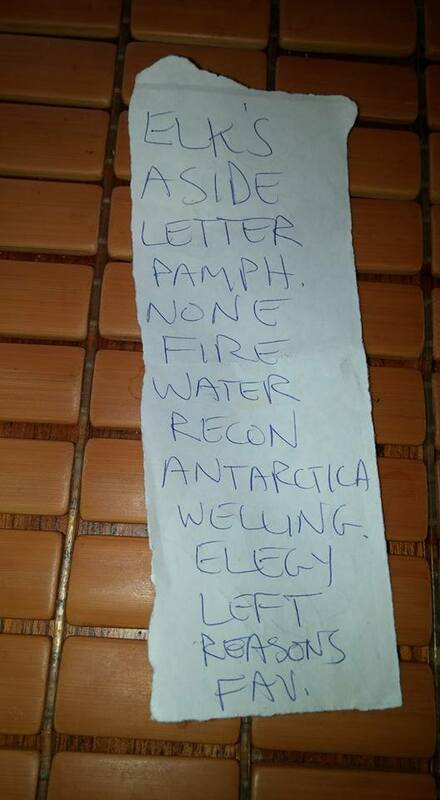 The Weakerthans’ set list from their November 2001 show at Babylon in Ottawa, ON. There I am 14 years-old and standing in a packed Babylon with my dad, Steve, and mom, Lise, so excited for The Weakerthans. They were about to take the stage after an amazing set by this little, lesser-known band at the time. You may have heard of them… The Constantines. The Weakerthans opened with a song I had never heard before, simply labeled “Elk’s” as you can see by the set list pictured (below/above) that my dad snagged and got signed. The song, “Psalm for the Elks Lodge Last Call”, would later find itself on Reconstruction Site in 2003, on their third album. Then without wasting any time they crowd favourite and high energy track “Aside.” I won’t give you a song by song breakdown, as the set list is posted, but it was really cool to hear new songs like “Psalm” and “Our Retired Explorer (Dines with Michel Foucault in Paris, 1961),” almost two years before their release. Before most shows that my dad and I attended together we would always ask each other what were our must hear songs. You know the one that you need to hear or almost no matter how good the show it can’t be amazing without. Well, young teenage Eric loved one Weakerthans song beyond all others, “Wellington Wednesday”. Steve had one song that also rose above the rest, “This Is a Fire Door, Never Leave Open”. The most vivid memory I have of this show is the look of pure joy and excitement on my dad’s face before he cheered louder than anyone else as they started “Fire Door”. Three songs later it was my turn for glee as Samson played “Wellington Wednesday” which might as well have been just for me. As he sang the chorus “Oh, you’ve got green eyes / Oh, you’ve got blue eyes / Oh, you’ve got grey eyes,” I could not be happier. I had no idea at the time that they were New Order lyrics, but it wouldn’t have changed a darn thing. I actually have eyes that change from blue to green to grey and always thought that was super cool as a kid. That song cemented it and my undying love for Winnipeg’s finest. 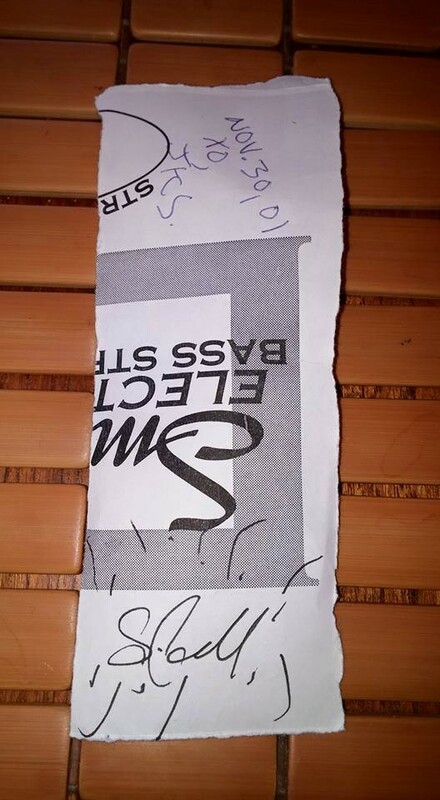 The autographed back of The Weakerthans’ set list from their November 2001 show at Babylon in Ottawa, ON. The other fond memory was seeing The Weakerthans live and realizing there really are two sides to punk, and that it is way more than just a sound. This was a man who came from Propagandhi‘s angry and political fast-paced music, to this often more slow emotional songs in forming The Weakerthans. But they were in no way less punk, they were just showing us a different way of doing it. They had the energy and excitement of a punk show, but coupled it with some soft and emotional tracks that could pierce even the toughest armour. And to top it all off Samson is kind of a goofball on stage and a super nice guy in person. I found what I thought was the audio of the entire set of that amazing night in late November 2001 recorded from the live CBC Radio 2 broadcast. Unfortunately it turns out what I found is the audio for a show three months prior. Still really cool and worth a listen as the quality is amazing and the set list is very close to the one I saw almost 14 years ago. You can download it here. RIP Weakerthans. Canada, and most specifically Winnipeg, mourns the loss of one of the best acts to grace this country for nearly two decades. So long to one great band.